She considers her performances with the New York Philharmonic at Carnegie Hall and the International Summer Academy of the Mozarteum in Salzburg, Austria , to be among the highlights of her career. FOREST HILLS, NY, September 21, 2018 — Marquis Who's Who, the world's premier publisher of biographical profiles, is proud to present Diana Mittler-Battipaglia with the Albert Nelson Marquis Lifetime Achievement Award. An accomplished listee, Dr. Mittler-Battipaglia celebrates many years' experience in her professional network, and has been noted for achievements, leadership qualities, and the credentials and successes she has accrued in her field. As in all Marquis Who's Who biographical volumes, individuals profiled are selected on the basis of current reference value. Factors such as position, noteworthy accomplishments, visibility, and prominence in a field are all taken into account during the selection process. 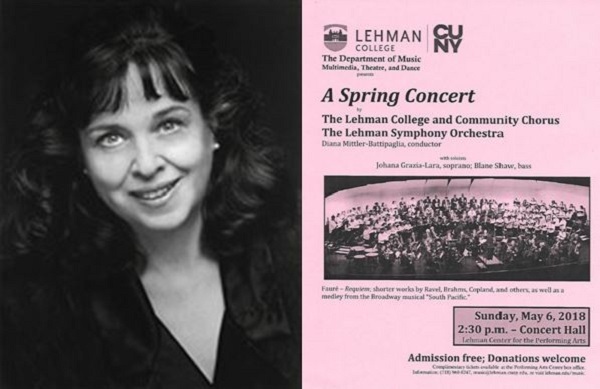 Since 1987, Dr. Mittler-Battipaglia has been Professor of Music at Lehman College of the City University of New York. Additionally, she has been the director and pianist of the Con Brio Ensemble since 1978, presenting annual series of chamber music concerts in the New York metropolitan area, and the choral director at Lehman College, conducting major works for chorus and orchestra. From 2011 to 2016, she was the elected chair of the Music Department in Lehman College, where she previously served as an associate professor of music from 1986 to 1987. Before taking this position, Dr. Mittler-Battipaglia was assistant principal of music and choral director at Bayside High School in Queens, NY from 1979 to 1986, and coordinator of music and choral director at Flushing High School in Queens, NY from 1968 to 1979. Her first professional role was as a teacher of music and choral director at William Cowper Junior High School and Springfield Gardens Junior High School in Queens, New York from 1963 to 1968. From 1964-1970, she served as associate conductor and pianist of the Queens Borough-Wide Junior High School Chorus. From 1987-1993, Dr. Mittler-Battipaglia was a consultant for educational projects at New World Records creating a curriculum for American Music, WNET, and the Flushing Council on Culture and the Arts. She served as pianist and member of the faculty at the Southern Vermont Music Festival from 1979 to 1983, and as an examiner for the Board of Examiners of the New York City Board of Education from 1985 to 1990. Dr. Mittler-Battipaglia was born into a family of Austrian refugee musicians who valued education and began playing the piano as a 6 year-old. Her first teachers were her mother, Regina Schilling Mittler, a graduate of the Vienna Conservatory, and her father, composer and pianist, Franz Mittler. At age 10, she was accepted as a scholarship student at the Juilliard Preparatory Division, where she studied from 1951 to 1958. She was also awarded a scholarship by the Doris Duke Foundation to attend the Professional Children's School, where she graduated as salutatorian. In addition to studies on the piano, she began serious study of the flute at the age of 11 and performed frequently with her mother as the accompanist. She performed as a piano concerto soloist with the New York Philharmonic in Carnegie Hall at the age of 14 and also appeared as piano soloist with the National Orchestral Association and the New Haven Symphony. In 1957, she was recorded as a flute soloist performing the obbligatos on a professional recording on Request Records titled, “Offenbach at his Best”. While in college, she performed as principal flutist with a number of local orchestras including the Columbia University Orchestra and the City Symphony. She continued her studies at Juilliard and earned a Bachelor of Science in 1962 and a Master of Science in 1963. Ultimately, she attended the Eastman School of Music, where she obtained a Doctor of Musical Arts in 1974. Dr. Mittler-Battipaglia made a successful New York piano solo recital debut in 1977 and performed in other solo and chamber music recitals at Weill (Carnegie) Recital Hall, Merkin Hall and at various colleges and universities. In July 1995, she appeared as a featured soloist in a concert of works by her father, Franz Mittler, at the International Summer Academy of the Mozarteum in Salzburg, Austria. In June 1996, this program was performed at Weill Recital Hall under the auspices of the Austrian Cultural Institute which also presented her in a concert of trios by Viennese émigré composers at Merkin Hall in 1997. In April 1998, she performed in a concert of her father's music at the Herbert von Karajan Centrum in Vienna under the auspices of the Orpheus Trust. She considers her performances with the New York Philharmonic at Carnegie Hall in 1956 and the International Summer Academy of the Mozarteum in Salzburg, Austria in 1995, to be among the highlights of her career. Dr. Mittler-Battipaglia was featured on a Preiser Records CD of the works of Franz Mittler performing his piano trio and solo pieces in 2003 and on the CD “Franz Mittler: Viennese Wunderkind: Sonatas for Cello and Piano and Violin and Piano” on Con Brio Records in 2008. She was also featured in the documentaries “Study with the Best” on the City University of New York TV in 2005 and “Last Stop, Kew Gardens” in 2007 shown on PBS. In addition to all of her musical work, she has also contributed many articles to professional journals and wrote “57 Lessons for the High School Music Class” in 1983,which was distributed city-wide by the New York City Board of Education, and “Franz Mittler: Austro-American Composer, Musician and Humorous Poet” published by Peter Lang in 1993. Beyond all of these contributions, Dr. Mittler-Battipaglia has been the choral director and accompanist for various charitable, religious, military and civic holiday functions. Moreover, she is a member of the American Choral Directors Association, the National Association for Music Education, Chamber Music America, Golden Key Society, and the American Federation of Musicians. Dr. Mittler-Battipaglia has been acknowledged for her many achievements over the years in the form of awards such as the Distinguished Service Award from Lehman College in 2012 and the Proclamation Lifetime Achievement Award from the New York State Assembly in 2009. Lehman College awarded her with the Excellence in Teaching Award in 1993 and the Prism Award for Pluralism and Diversity in 1996. She was also recognized as a New York State Regents Scholar from 1958 to 1961 and received an excellence in teaching award from the New York City Board of Education in the 1970's. In recognition of outstanding contributions to her profession and the Marquis Who's Who community, Dr. Mittler-Battipaglia has been featured on the Albert Nelson Marquis Lifetime Achievement website. Please visit www.ltachievers.com for more information about this honor.